We won the battle. Help us win the war. Tuesday night was a good night for Michigan, and a good night for Freedom. For the last several months, we have been engaged in the fight to support conservative individuals who stand up for you, the taxpayer, by advocating for policies that reduce the size, scope, and cost of government. We have knocked on doors, sent mail, launched digital ads and microsites, and left it all on the field of battle. 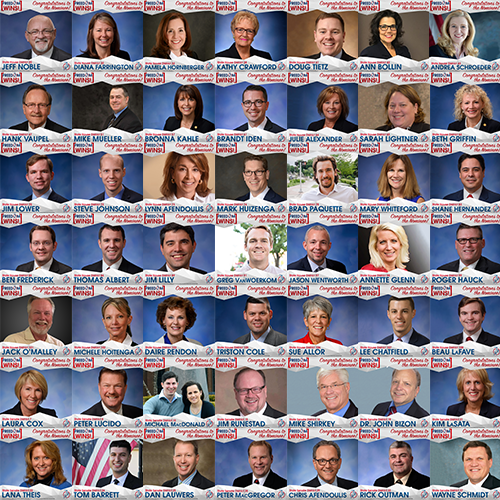 We endorsed in 55 races – 37 State House candidates, and 18 State Senate candidates. Each candidate was evaluated based on a variety of criteria, including their support for workers’ rights and free market principles. Against some very tough odds, and despite being outspent by forces that would limit your freedom, we won in 49 of those races. Victory has a hundred fathers and defeat is an orphan. This victory belongs to you – the men and women who have supported the Michigan Freedom Network and our candidates. We won the battle, but the war isn’t over. In less than two weeks, Michiganders from across the state will gather at the Republican and Democrat state conventions to solidify their slates. In less than three months, we will go back to the polls to cast our vote for the candidates and policies that will shape the future of our state, and our country. With your help, we will continue to fight, and we will win.